The final stages of winter are finally upon us, so we can finally look forward to spring. Spring, as we all know, is the best time for pretty pastel colors and all of the Starbucks ice-blended delicacies we can get our hands on. 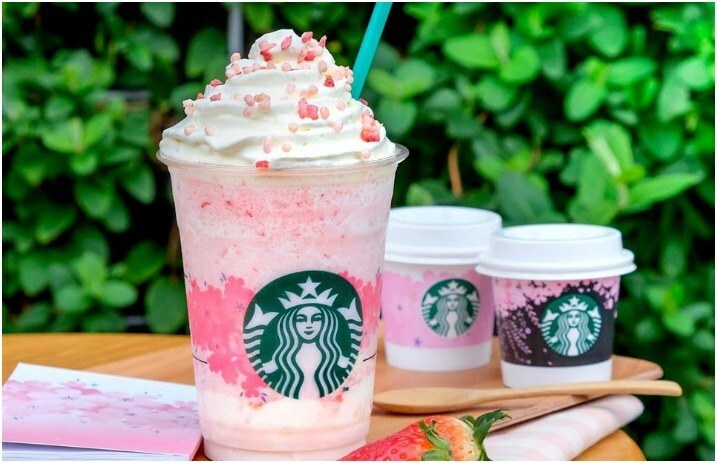 Lucky for us, Starbucks has unveild their newest drink, and it's one of the prettiest drinks we've laid our eyes on yet. As Bustle explains, the Strawberry Honey Blossom Crème Frappuccino is a strawberry and vanilla créme flavored frappuccino, perfect for springtime adventures. The whipped cream that's on top of the drink—and the bottom of the drink as well—is honey-flavored. There are also freeze-dried strawberries mixed throughout the drink, with crunchy pink rice puffs for decoration and a bit of texture on top. Before we continue, we have to let you know: This drink isn't going to be featured in the United States. As of right now, the drink is exclusively in Starbucks chains located in Thailand and Hong Kong. As Bustle reports, the drink will only be available for a limited time, so it's not going to be staying to tease us that we can't have it for too long.